As concerns grow over aging rail infrastructure, earthquake readiness and a dramatic increase in crude oil shipments by train, state railroad regulators are scrambling to hire their first-ever railroad bridge inspectors — two of them. Once they are hired, the California Public Utilities Commission plans to create a state railroad bridge inventory to determine which are most at risk. That’s right — neither the state nor federal government has a list of railroad bridges for California or the rest of the country. Until that happens, the safety of California’s thousands of railroad bridges — key conduits that carry people and hazardous materials over environmentally sensitive ecosystems and near urban areas — is left up to rail line owners and a single federal inspector who splits his time among 11 states. No California rail bridges have failed in recent memory, but the 6.0 earthquake that rattled the Napa area on Aug. 24 provided a reminder that California must monitor its aging rail infrastructure. Following the quake, the Federal Railroad Administration worked with Caltrans to contact railroads within a 100-mile radius and ensure bridges and tracks were inspected for damage before resuming normal operations. The Napa Valley Wine Train, which was closed for two days after the quake, had its own private inspector go over the tracks and numerous bridges, including one traversing Highway 29. The inspector gave the green light to continue running Aug. 26. Caltrans employs 120 inspectors and 80 specialty personnel to inspect the state’s public automobile highway bridges to ensure the integrity of the elevated structures, in comparison to the one federal inspector for all of California’s rail bridges, most of which are privately owned. Those railroad bridges are inspected, maintained and regulated by company personnel, but watchdogs say that’s far from adequate. “There are many unknown questions regarding bridge integrity that need to be answered to ensure public safety,” the report found. The Benicia-Martinez Rail Drawbridge, built in 1930 and tucked between the automobile spans, carries hazardous material shipments across the Carquinez Strait to East Bay refineries, along with 30 Amtrak Capitol Corridor passenger trains each weekday. The bridge is owned by Union Pacific and is safe, the company’s spokesman said. Union Pacific has spent more than $42 billion on infrastructure, Hunt said, not specifying what portion of that was devoted to bridges, including $4.1 billion scheduled for this year. “These are private investments, not taxpayer dollars,” he said. Concern has grown about bridge safety and rail safety in general with the increase of crude oil shipments by rail. They’ve jumped 158 percent in California from just September to December 2013, according to the state energy commission. This year, the CPUC created the Crude Oil Reconnaissance Team to monitor the oil-by-train boom to ensure federal and state safety laws are followed. In response to the increase and some deadly accidents, including a derailment last summer in Quebec, Canada, that killed 47 people, the U.S. Department of Transportation proposed tank car safety upgrades. 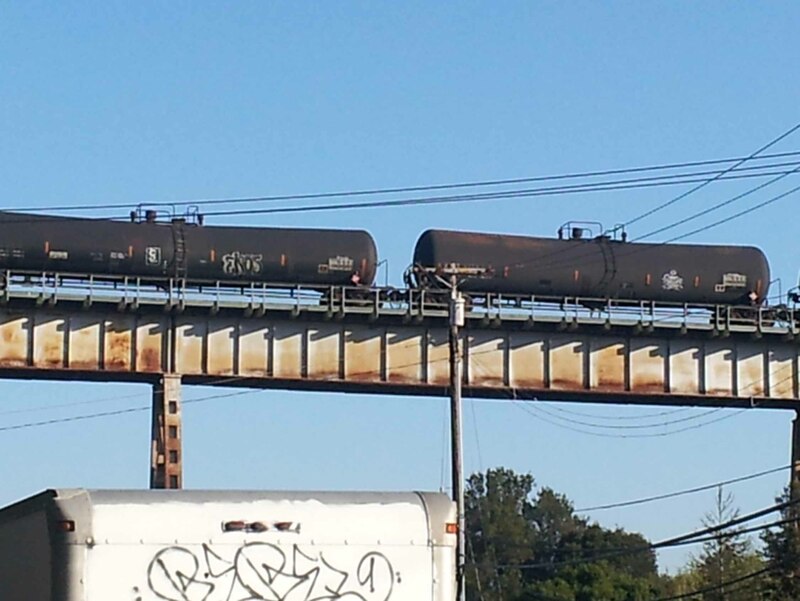 As of now, about 100 rail cars of crude roll through populated areas of the East Bay each week along the BNSF line from Stockton to Kinder Morgan’s rail depot in Richmond. The route traverses the 1,690-foot-long, 80-foot-high Muir Trestle, above Alhambra Avenue in Martinez. The trestle was constructed in 1899 and rebuilt 30 years later. Those rail cars rumble through Antioch, Pittsburg, Bay Point, Martinez, and Hercules, said Contra Costa Hazardous Materials chief Randy Sawyer. Based on total track miles and federal estimates of a bridge occurring every 1.25 miles of track, the CPUC estimates there are about 5,000 California railroad bridges. Most are old steel and timber structures built more than 100 years ago, and “actual railroad bridge plans or records are either absent or unreliable,” the CPUC report found. American Society of Civil Engineers past President Andy Herrmann, a bridge consultant, said companies balk at releasing bridge data for competitive reasons, but he believes bridges are maintained safely. In 1991, a freight train traversing steep switchbacks in Dunsmuir, Siskiyou County, derailed, sending rail cars tumbling off a bridge and resulting in 19,000 gallons of metam sodium, a concentrated herbicide, leaking into the upper Sacramento River. The accident killed all vegetation, fish and other aquatic animals 45 miles downstream, rendering some invertebrate species extinct. Several hundred people exposed to the contaminated water required medical treatment in what’s still considered the worst inland ecological disaster in the state. Although the accident was not caused by bridge failure, it led the railroad to build a derailment barrier on the Cantara Loop bridge to prevent it happening again. And the Federal Railroad Administration expressed concern about the condition of bridges generally in a wide-ranging review after the crash. “The review was prompted by the agency’s perception that the bridge population was aging, traffic density and loads were increasing on many routes, and the consequences of a bridge failure could be catastrophic,” according to a report published in 1991, the same year as the crash. From 1982 to 2008, records show there were 58 train accidents nationwide caused by the structural failure of a railroad bridge, causing nine injuries and about $26.5 million in damages. As of July 2010, new federal rules require rail companies prepare bridge management programs — including annual inspections, maintenance inventories and more — that are made available to federal inspectors when asked. The Federal Railroad Administration can levy fines up to $100,000 for failure to comply. That shortfall prompted state regulators to hire their own bridge inspectors, and they have already designed a bridge evaluation form and experimented with performing inspections.